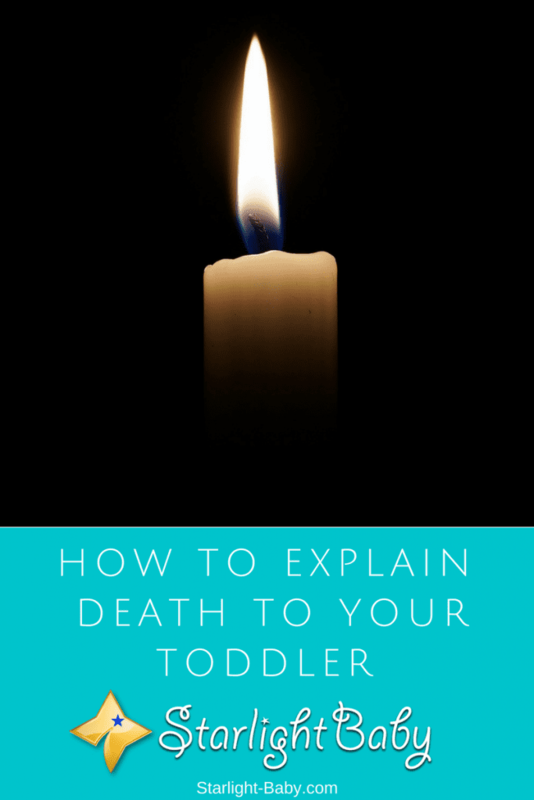 How Do I Explain Death To My Toddler? The concept of death is difficult enough for adults to understand, so how can you expect a toddler to grasp this serious life event? The truth is, they can’t. Toddlers cannot usually comprehend death or the fact they aren’t going to see somebody again. So, when it comes time to tell them somebody close to them has passed away, it can be a significant challenge. However, that isn’t to say they shouldn’t be told. Our children are more in tune with our feelings than we often realize. Just because your toddler cannot understand death, does not mean they won’t know something sad has happened. Here we’ll look at how to approach the topic of death with a toddler in a way they can understand, and what to expect when you do. Perhaps the biggest dilemma parents face, is whether they should lie to protect their toddler. After all, they won’t understand so what’s the harm in lying? It seems easier to say that grandma or grandpa have gone on a long trip for example, than it is to say they passed away. While logically, it may seem better to lie, in the long-term you aren’t protecting your little one. Death is a part of life and it’s something they will start to comprehend as they get older. By telling them the truth now, while they may not fully understand, it teaches them that they can trust you. In a few years’ time, when you finally do tell them the truth, they will realize you lied and that can break trust – as well as make it harder to understand and accept future losses they experience. Equally as important, is to listen. Pay attention to your toddler’s response, answer their questions and allow them to talk to you about it. Or, if they are simply too young to have a discussion about it, just try to be as reassuring as you can be. After the death of a loved one, there’s often an initial period of disruption. The phone will ring more frequently and people will turn up to the house to pay their condolences. Your toddler will pick up on these changes and know something is going on. If they pick up on your anxiety and sadness, they too will have an emotional response. They may need to be held more frequently or reassured more for example. So, we’ve established you should tell them the truth, rather than trying to shield them from it. The question is, how should you tell them? The best way to tell your toddler about death is to keep it simple. However, it’s important to say more than just “grandpa has died”. Remember, toddlers can’t comprehend what this means. So, to help them, you’re going to need to give them a few more details. It can be really helpful to explain what death means. Explain that grandpa (for example), has died and his heart has stopped beating, along with the fact that he can’t feel anything and doesn’t need to eat or sleep anymore. This gives your toddler some indication of what it means to be dead. They still aren’t likely to understand that their loved one isn’t coming back, even if you go on to explain about them going to heaven, or another religious place. As they get older, they will be better able to understand the concept of religion and that these are places we cannot see or visit. However, for now you will need to keep patiently explaining that grandpa isn’t coming back. One tip here is to explain the death process in small doses. If you try to sit your toddler down and tell them everything in one go, they can end up feeling overwhelmed. As they don’t understand they may end up getting upset and frustrated. So, only go into more details when they show an interest and ask questions. Children’s books about death may help explain some of these concepts in a way they can easily understand, and many toddlers will often ask to have these books read to them when they’re missing their loved one or want to know more. As well as explaining the basis of death, it can also be helpful to talk about how people might feel when somebody has died. Talk about how people can feel, sad, angry and confused. You can also explain that it can make people cry and that you, for example, may cry sometimes. Though you might want to try to hide your own emotions from your toddler, it’s better not to. They will see your own reactions to death and learn through them. Should Toddlers Attend The Funeral? Generally speaking, no child is too young to attend a funeral. However, each toddler is different. As long as they are well-prepared for what will happen and they are guided through the funeral process, it can be a beneficial experience. Leaving them out of the grieving process can leave your toddler feeling like they aren’t part of the family. Just be sure to have somebody at the funeral who can leave with your toddler if they want to. While it is beneficial to have them there, toddlers will struggle to stay focused and quiet for the entire day. Overall, explaining death to a toddler isn’t easy. As a parent, your instinct is to protect and shield your little one from the nasty parts of life. So, you’re naturally going to be reluctant to talk about death. However, doing so now, following the advice above, will help to prevent any unhealthy attitudes towards death later in life. Oh god, this topic awaits for me in the future since he has never asked us about death yet and we never specifically told him anything about it. Luckily, we haven’t had anybody pass away for a long time now but I do realize that sooner or later it will happen and that we will have to be able to explain it all to him. It just scares me because even ourselves have problems accepting and fully grasping death. I don’t want him to panic and think that now we will all die or something silly like that. I really like your idea of telling toddlers about it in portions and not all at once. Death is such a big thing to understand so trying to explain it one go seems overwhelming for the child. I will try to build up the courage and get my husband to help me explain it to him, I know that it’s necessary. My father was an orphan. He was raised by his aunt. When my father’s aunt died, I was 4 years old. I think I was too young to understand death. I was told that my grand aunt had gone to the temple and would not return for a long time. The cremation ground was very close to the temple. Few months later, I asked when will she return he said he will not because she went to God’s house. I did not understand death until I was nine years old when my teacher told that when people die they will never return to the earth. It is really hard to explain a toddler about death.